» After the impact of “Metaphortime”, one can say that its successor was pretty much awaited. Three years later, the expectations were replaced by satisfaction, given the quality of this “Smooth Comforts False”. A list of guests made the sound of this new work more distinct, starting right on with “Faraway Embrace”, featuring Adolfo Luxúria Canibal. His unmistakable voice recites some verses in Portuguese, that I don’t know if he wrote them himself, but they surely sound like his. Something we wouldn’t expect in a death/doom track – despite the creepy nature of the MÃO MORTA’s singer – but that turned out extremely well. “Psi-drama” comes next, mainly death in the beginning (a bit black, even, if I’m allowed to say so), a worked-up guitar solo in the middle, and a surprising finale mingled with jazz, led by trumpet player Ricardo Formoso. As if to emphasise the “mysterious” part on “Mysterious Hours”, the band’s doom vein prevails here, in a dark and seductive melody. The instrumental “Foretoken” opens the way to “Evil Dreams”, where a new guest – Yossi Sa’aron from ORPHANED LAND – countervails the aggressiveness with the melody of his bouzouki. “Winter Threat”, on the other hand, heads towards the gothic. Marco “Dust” Benevento (HOW LIKE A WINTER, THE FORESHADOWING, KAMLATH) replaces Pedrão Silva on the male voices and delivers “that” deep and enticing tone of the gothic melancholy. 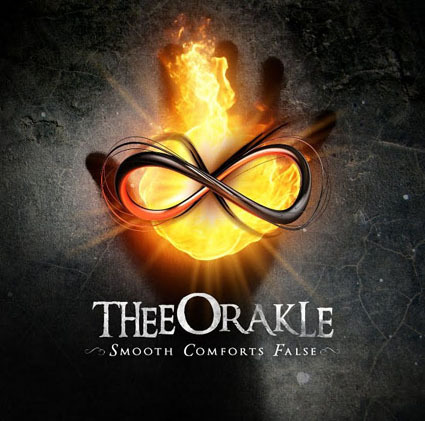 “Smooth Comforts False” had been announced as an approach to something more progressive and experimental, and it’s its final tracks that THEE ORAKLE carved a bigger impression in that field, especially in terms of sharp shifts in tempo. And “Rescue Of Mind” merges the band with jazz once again, this time with the sax of Fábio Almeida. Once the opener ‘Faraway Embrace’ breaks out there is a heightened anticipation of something special ahead. The track paces with muscular riffs and controlling rhythms whilst the guitars entice and tease with fleeting grooves. The keys float in between to wrap themselves around the ear as the growls of Silva add an edge to the song. Once the wonderful vocals of Cardoso join the mix to contrast and accompany her harsher vocal companion the song is a full joy. Every song is masterful and deeply pleasing from the schizophrenically tinged ‘Psi-drama’ with its glorious jazz noir elements and lone soulful trumpet of Ricardo Formoso, the gothic impassioned ‘Winter Threat’ featuring additional vocals from Marco Benevento (The Foreshadowing), to the brilliant ‘The Bridge of the River Flowing’ with its wonderful niggling metallic riffs and melodic caresses. Best song though is ‘Rescue of Mind’, a track which rampages across and explores the senses with abrupt rhythms, skilled direction changes and gloriously crafted innovation. The album produced by Daniel Cardoso, who is an impressive and emerging major force in metal, ends with its best track in Rescue of Mind. The track rampages and stomps from the off earning its right to full attention with an eager immediacy. As it pounds and explores the senses it ripples with skilled direction changes, gloriously crafted innovation , and striking invention, the dazzling mid jazz off shoot soon merging wonderfully into the muscular mass, the song the proof of a band with the ability to create aural Masters.